The Share Thy Shakespeare Challenge is not so much a challenge to think of a line from Shakespeare or a book or a sonnet, but a challenge to stop and think about Shakespeare. Try and remember the first time you heard a piece of Shakespeare or the first thing that comes to mind when you think of Shakespeare. So think about William Shakespeare and we want to know what comes to your mind. Need Help reading Shakespeare? How about some help that is fun to read click here for Joseph Smigelski's "How to Enjoy Reading Shakespeare." Know of a particularly good Shakespeare Festival, please tell us! Join the celebration and Talk Like Shakespeare. Write down your thoughts on Shakespeare and post. First of all, I LOVE that my daughters love Shakespeare. Our love is thanks to a few things: Stanley Tucci, Lakeside Shakespeare Theater and William himself. Stanely Tucci because he was in A Midsummer Night's Dream (along with Michelle Pfeiffer, Kevin Klein and many others www.imdb.com/title/tt0140379/) I loved everything about the movie and since I loved it, we watched it together and now we all love it. The girls were introduced to Shakespeare through film and listening to stories read aloud --they like the way it sounds. Lakeside Shakespeare Theater (lakesideshakespeare.org) must be thanked as the lovely actors gave the Sisters their first taste of outdoor Shakespeare and they were instantly hooked. And I must thank William himself --for Romeo and Juliet, for Petruchio and Katherina, for Oberon and Titania --while I do find the language challenging-- the more I watch the plays and read the books the more I learn, there is always more and that is the magic of Shakespeare --it never gets old!! for speech is the blood of society! than be mute in a scentless piety. P.S. You'll know why I like this if you've read the book or watched the play or movie --its a comedy and this scene is actually played by a man who realizes in this scene that he's a good actor. My first Shakespeare experience was to see Taming of the Shrew in modern dress. I think I was in middle school. The coolest thing about it was the stage that turned - it was a circle! It is said that the UK and USA are countries divided by a common language! Not really nowadays, though you guys over there do need some help with your spelling! The English used by Shakespeare (as with King James Bible and Book of Common Prayer - best usage at the time) is still essentially in use today - without Thee/Thou! Words change ("indifferent" = careless now, impartial then) - it's the ideas, situations and characters that REALLY count. That's why, for instance, Romeo and Juliet translates to West Side Story, etc. But he does have a way with words! Don't overlook the Sonnets. Best wishes to all. Personally, I think that the most interesting thing about Shakespeare is the language used as it shows how English has evolved (as it still is evolving)Also the time that it was written was a very traumatic time to be around. Conditions for the ordinary people were very harsh and the judicial system wasn't exactly a bundle of laughter either if you happened to be on the wrong side of it. Of course, some people take delight in looking for conspiracies and now some question if Shakespaere was in fact more than one person and if so, how many of them worked together and who were they? At least with the modern poets (People like Spike Milligan, Harry Graham and A.A. Milne), we don't get that problem. I have read and loved Shakespeare at many points in my life. One of my favorite Shakespeare memories is from my Senior year in college. I took a couple summer courses and one of them was a Shakespeare course. I spent that entire lovely semester biking through MSU's beautifully treed summer-quiet campus and reading plays on the river bank. Moving from one patch of warm sun to another while absorbing each perfectly turned phrase. Meeting up with classmates over coffee to read passages aloud. I couldn't respond to your Shakespeare challenge immediately because it set my mind going in too many different directions and I couldn't stop it. So let me try to sort some things out and I'll write more than one entry (and perhaps another challenge) so you don't have to read this all at once. 1. My favorite Shakespearean play is Hamlet. 2. In my senior year of high school we presented A Midsummer Night's Dream. I played Hippolyta who is, basically, just Theseus's eye-candy trophy. But I know the play well and enjoy it. 7. I thought of other book titles that are references to other works and how, when you're a reader, "...way leads unto way...": Steinbeck: Of Mice and Men, The Grapes of Wrath; Hemingway: For Whom the Bell Tolls, The Sun Also Rises... and I finally cried to my mind, STOP! 8. P.S. My mind went on to times I've borrowed from Shakespeare. Twice I've begun a shared recollection at a funeral with Marc Antony's words from Julius Caesar: "He (she) was my friend, faithful and just to me." And on the front of the program for my husband's funeral, these words from Hamlet, "Now cracks a noble heart, - Good night, sweet prince; And flights of angels sing thee to thy rest!" High School English & the play was Romeo & Juliet. Night's Dream. Love those fairy names. 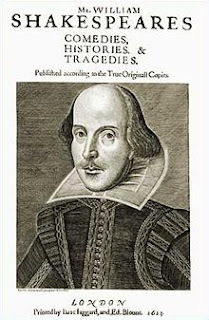 Shakespeare … what a marvelous icon! Probably the two plays I remember most from my early years are Midsummer Night’s Dream and then later in high school, the Taming of the Shrew. The former was sweetly mysterious with fairy worlds; while the latter was an insight into the Shakespearean era! Hamlet and Henry V were favorites in high school. We would read the play and then watch the film. Henry V’s St. Crispen's Day Speech filled my mind with thoughts of valor and chivalry. Kudos on the Big Sister’s topic and the Big & Little Sister’s love of Shakespeare at such early ages! In high school I made a point to have a few of his sonnets commited to memory to impress girls from Sacred Heart. While in Antarctica for the year, I committed myself to re-reading the complete works of Shakespeare. Then, I found out my friend Michael had also embarked on this lofty goal, so we began getting a group together every couple of weeks to read a play aloud. Snacks and drinks are provided, and we draw character names out of a hat to see which part we get to read for each Act. Men play women, young plays old, and if you don't like your part, you get to switch soon. It is a great deal of fun to be drawn in by this amazing playwright and poet, even all the way down here at the bottom of the world! Next up: Titus! I was very fortunate to have the Inimitable Mrs S for a fifth grade teacher. She was like SARK before I knew SARK existed. She started a cool children's choir (as opposed to a lofty and official Children's Choir) taught Creative Writing to kids as early as 3rd grade, and delivered William Shakespeare to our 5th grade classroom. We built our own version of his Globe Theatre (which is now, in a random act of auspiciosness, a part of the fort in our back yard! )we made costumes in full Elizabethan high fashion, and we produced quality performances as children, by children, for adults (and children). This early introduction made me understand and be comfortable with difficult literature and I learned to speak and dance and carry on in play after play! I also grew up to marry the 5th grade Romeo, by the way! I have a cool old book that outlines and discusses all of the plants and herbs mentioned in Shakespeare's plays ,it's kinda fun. Thanks for reminding me that Ol' William is a fun (if arduous) read! What fun! Who would ever think of such a thing?! The book world is a marvelous place! Don't remember all the details, but I was lucky enough to get to act out the witch scene with a few good friends. I've never forgotten the above chant...and very excited to talk in a shaky, crackly, voice. i love love love love love love love love love love love love love love love love any Shakespeare !!!!!! Every year we go to Stratford, we never MISS --ever. What would life be without William?